I had a request for a volcano cake for my sister’s best friend’s son for his 10th birthday. 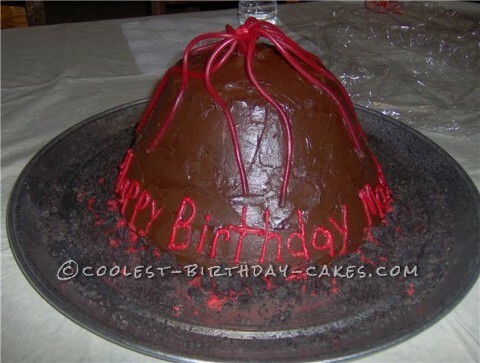 He is really into science and his mom thought a volcano cake would be a great surprise for him. I baked chocolate cakes in two different sized metal bowls. I then stacked the cakes on top of one another and carved them until they were the perfect volcano shape. I used chocolate butter cream icing for the cake. I then cut a hole in the top, middle of the cake and put cherry pull and peel Twizzler candy inside to look like lava flowing out of the volcano. I used crushed up Oreo’s dotted with red butter cream to look like ash and lava surrounding the bottom of the volcano. I also wrote a message on the cake with red butter cream. The boy was surprised and excited about his volcano cake. His mother loved it as well! It was definitely a cool (or should I say HOT!) cake for a boy his age! Birthday cake idea posted by Becky S.